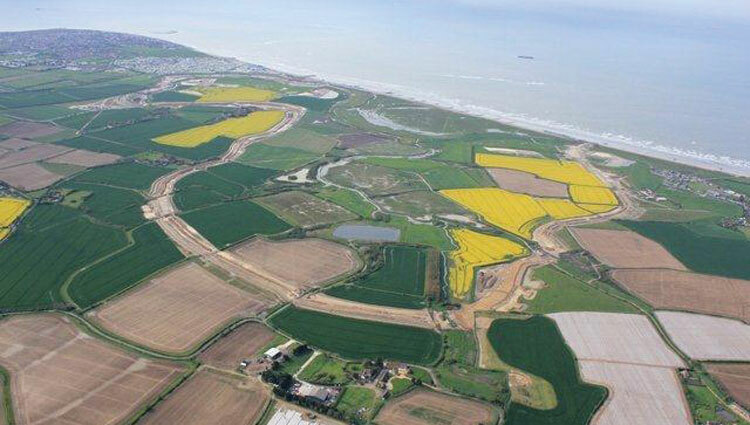 Completed in November 2013, the multi-award winning Medmerry Managed Realignment Scheme, at Selsey in West Sussex, includes the largest realignment of open coast in the UK. ‘Managed realignment’ involves building new defences inland from the coast and allowing a new intertidal area to form seaward of the new defences. ‘Intertidal’ refers to the land that is exposed at low tide and covered by the sea at high tide. The scheme, carried out on behalf of the Environment Agency, is a key element in a 15-year project to provide 7km of new sea defences to protect local communities in West Sussex, while at the same time creating a large nature reserve. Following extensive consultation on the 2008 Pagham to East Head Coastal Defence Strategy, the managed realignment scheme became the adopted solution for Medmerry, allowing a new 300 hectare intertidal area to form seaward of the new defences. The new defences at Medmerry significantly reduce the flood risk to nearly 350 homes, local infrastructure and the main road into the village of Selsey. and are designed to provide protection against rising sea levels over the next 100 years. The ground breaking project has also created more than 180 hectares of important new wildlife habitat to help compensate for the loss of similar conservation areas in and around the Solent. With the flood defences complete, 10km of new footpaths, cycleways and bridleways were also created across the site. The 450,000 m3 of earth required for the new defences was dug from within the site which avoided more than 40,000 lorry movements on the local road network. In addition, the 60,000 tonnes of rock used to build the structures at each end of the scheme were delivered by sea to further minimise impact on the local road network. Throughout construction the project team took great care to protect the existing wildlife on the site and to record features of archaeological interest. The final dramatic stages of the scheme were captured in a BBC South news report and by two time lapse cameras on the Environment Agency website. The time lapse cameras have captured the excavation of the breach area up to the back of the existing shingle bank. Click here to view the final stages of the site works via the two time lapse cameras.